Last month, Gallereo made its first public appearance at an art fair by showcasing artists and their dazzling websites at the NewcastleGateshead Art Fair. We had such a great response to what we are doing that we are going to be doing the same again, only this time we're taking the show to Manchester. 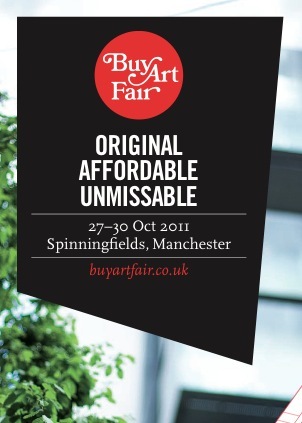 From the 27th - 30th October, Spinningfields in Manchester will be home to one of the most contemporary and successful affordable art fairs. The Buy Art Fair has been going from strength to strength in recent years, reporting good numebrs in both attendance and sales. Gallereo will be settling in at stand 26 at this years fair, in an effort to spread the word about who we are, and what we do. We will also be showcasing a range of artwork from artists in the Gallereo network. Visitors to the fair will be able to get a glimpse of the sort of artists that we have on board, as well as looking at a host of websites that have been created through our website builder. If you get your timing right, you may even have a chance to talk to some of the artists themselves and get a first hand account of what it's like to work with us. We're excited to be taking Gallereo to Manchester, and we hope that we have as good a response to website building as we did in Newcastle, and we hope to keep encouraging interest in the work of the artists that are coming along for the ride. For a full run down of who, what, why, where and when, visit our exhibitions website for news and updates about the fair.